Amazon Price: $63.99 (as of October 16, 2017 2:11 pm - Details). Product prices and availability are accurate as of the date/time indicated and are subject to change. Any price and availability information displayed on the Amazon site at the time of purchase will apply to the purchase of this product. This unique and tropical necklace was designed by artisan siblings Brian and Bella from the Philippines. 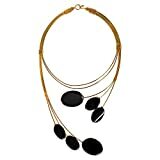 The necklace features a floating oval design in reconstructed black agate. A distinctive and eye-catching piece to add to your collection. PLEASE NOTE: The handcrafted nature of this product will produce minor differences in design, sizing and weight. Variations will occur from piece to piece, measurements may vary slightly. ARTISAN STORY: Brian and Bella are siblings who love to design jewelry and handicrafts. They began learning their trade at a young age from their mother. Living in the Philippines, they are never far from the sandy beaches and the dynamic ocean, where they draw most of their inspirations. The pair enjoy fusing modern design principles with local and native material found in the islands such as shells, wood, and stones. To honor their mother, Brian and Bella decided to name the store after her, Cherie.